SAN DIEGO, CA – Legislative challenges continue to face the composite panel industry as it continues to show signs of improvement. These and other issues are among those discussed at the spring meeting of the Composite Panel Association. Nearly 250 people, including representatives from more than 100 composite panel manufacturers and industry suppliers, are in attendance at the biannual association meeting. The event continues through May 7 in San Diego, CA. CPA Chairman Bryan Wilson kicked off the meeting Monday morning with a look at “Better Days, Challenges Ahead.” Wilson, of Temple-Inland, noted the industry “is getting healthier,” with projections calling for shipments to be up 7% over 2012. However, he added, “Mill capacity utilization rates are improved, but still very regionalized.” Mill capacity is currently down 2% from last year. The panel industry continues to face a number of issues in 2013, he said. “Biomass is a greater challenge now, and more interests have a stake in the outcome. 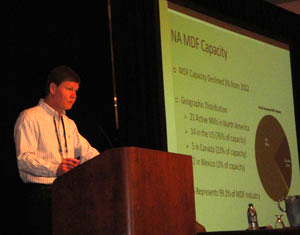 The growth of wood pellet production, especially in the southeastern US and destined for Europe, adds to the pressure on fiber availability and cost,” Wilson noted in his presentation. Formaldehyde regulation is also critical to the composite panel industry. Wilson noted that preliminary CARB amendments have been proposed and will likely be adopted by year’s end. “This should follow issuance of the final federal formaldehyde standard.” EPA has yet to report the final federal rule to Congress, despite a Jan. 1 deadline. Key issues for CPA regarding formaldehyde regulation include: consistency between California’s rules and federal regulations, and a tougher global third-party certifier system.